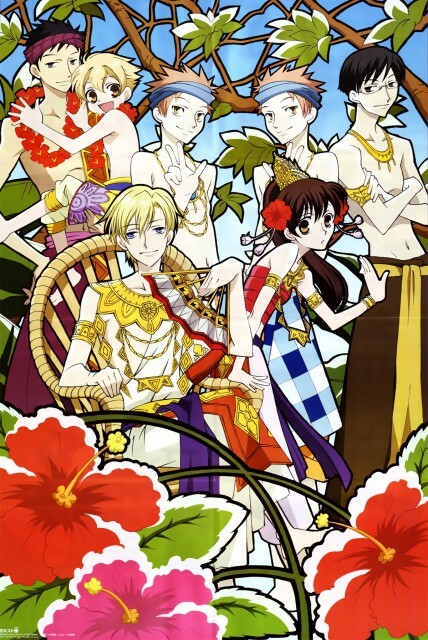 Ouran High School Host Club: In the Jungle..
Minitokyo »	Ouran High School Host Club Scans » Ouran High School Host Club: In the Jungle.. I really liked the design and artstyle of this! So cool! The hibiscus are really pretty! wow, the work here is like a stain glass art! This is really nice, thanks for sharing. Cosplay for the host club is good! X3 Thanks for sharing! Wow, love it, it is a great picture. Really nice! Haruhi looks great with her hair like that! King and Queen there... lovely! I absolutely love Haruhi here. Am I the only one who gets a hint of Tsubasa from this scan? Tamaki looks like royalty, rofl. Thanks for sharing this! It a very tropical scan! thanx! Cool :D I love the bright colors. wo haruhi is in long hair..